Safety is a common conversation, explicitly or implicitly, in the halls of middle management. Change agents among the ranks of middle managers experience conversations about the need for safety and the dangers of change on a daily basis. Safety is the focus because there are many for whom safety means the preservation of status, roles and resources. 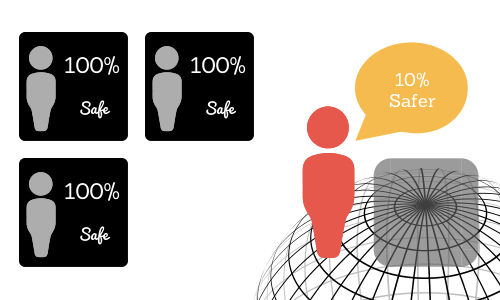 We need to move from safety to making our organisations safer for a world of rapid networked change. Comfortable Accountabilities: Accountabilities should be designed with reference to achievable measures, preferably internal measures related to the discipline. Limited Stakeholders: A few internal stakeholders often from similar functions with similar ideas and ideally few customer or community stakeholders who may introduce different perspectives and diverse issues. Limited Transparency: With utmost politeness, share little and participate little in the concerns of the rest of the organisation to preserve the comfort of your domain. Stability: Ensure there is minimum change in business environment, even if this includes refusing to acknowledge market changes. Minimum Risk: Avoid any change that offers risk. Why jeopardise an environment under close control? The core of these definitions of safety is the idea that the threats to middle managers are internal. The biggest threats comes from other managers or senior management. The external world is not a cause for concern. Safety comes from building an walled fortress within the organisation and focusing internally. In the rapid change of our current business environment, the greatest risk to middle management is not internal. The need for change, the pace of change and its impacts are being driven in the networks around the organisation. Middle management has much more to fear from changing consumer and social behaviour, disruptive technologies and networked ways of working. The classic middle management definition of safety makes nobody safer. By turning inward, by resisting accountabilities, stretch and change, these managers guarantee that their organisations are exposed to much more wrenching changes than need be the case. Each of these elements of safety stand in the way of an open, agile and responsive organisation. When middle managers choose to act as barriers to change, the forces of change risk sweeping whole layers and organisations of managers away. By focusing on a misguided view of individual safety, these managers make the organisation more unsafe as a collective. Leaders who do not challenge a culture of safety in their organisation are putting their whole organisation at risk. Leaders need to be working to make the organisation more responsive. The safer organisation adapts. Leaders, change agents and forward thinking middle managers need to disrupt this misguided culture of safety in organisations. The conversation must not be about safety but how to make the organisation safer through adaption. This disruption must involve conflict with traditional views. However, that disruption will help the organisation adapt to a safer culture that opens the organisation up to its internal and external networks. Push for external accountabilities: Raise the bar on performance. Measure customer outcomes. Consider end-to-end process performance to cut across siloed walls. Look externally for measures of success (and not just in the same industry). Bring in external stakeholders: If customers, community, employees and other partners are not stakeholders in the organisations decisions then gather their perspectives and bring them into discussions across the organisation. There is enormous power in real external views of the organisation, its purposes and performance. Network the organisation: Focus on increasing the flow of information and knowledge within the organisation. Demonstrate the value of collaboration and cooperation in greater efficiency, innovation and engagement in the way work is done. Foster diverse perspectives on the way forward. Most importantly of all delegate outcomes and enable people to make change to adapt without reference to the hierarchy. Experiment: The new definition of safety needs to be a well-run experiment to improve performance. The absence of well-run experiments is a sign of major concern. If you are not testing the way forward in changing times, then you are taking big risks. You don’t need to be CEO to drive these changes to make a more responsive organisation. (Undoubtedly, it helps). You will need to effectively manage your role & influence in the organisation. However, effective change agents and middle managers can begin to ask the questions and start new conversations leveraging external perspectives. Most importantly of all they can build a network of others frustrated by the culture of safety and work together for change. Management practice is influenced heavily by hierarchy, tradition and risk aversion. 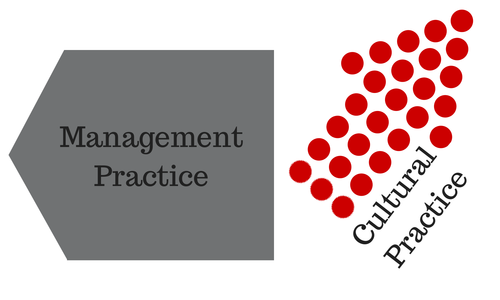 As a result our practice as managers lags the changes in culture in the society around us. Leaders need to work to close the gap between management practice and social expectations. the diversity of our organisations does not reflect the diversity of our communities. Gender is just one diversity dimension in which management practices lag that the practices and views of society as a whole. resistance to give up hierarchy, planning and demands for predictability and certainty when even the political structures based in these models have surrendered to approaches that operate far more adaptively and responsively. Our cultural products adapt far more quickly to changes in society than our management practices. Film, television, music and other forms of entertainment rapidly embrace changes in the way society operate and reflect that in the protagonists of the stories, songs and other art forms. An example can be seen in the role of the detective in arts like novels, film and television. In the birth of the industrial era, the detective was a logician, like Sherlock Holmes unravelling facts and relying on expertise in predictable processes, By the early 20th century the detective was a master of the human elements of relationships, like Simenon’s Maigret. The uncertain times of the mid century introduced the detective in a much more ambiguous role. Richard Martin has documented how the changing nature of the detective film reflects our changing society. Cultural products appeal to our need to be entertained, connect and engage with each other. Therefore they must be relevant to our society as it is today. Art is an experimental market where failure is common and success is usually defined only by audience acceptance. Someone is always seeking a better way to express the zeitgeist. Why does management practice lag changes in the culture of society? Focus on best practice: Best practice is historical and often particularly contextual. However, managers are often reluctant to move beyond accepted best practice. As Harold Jarche has argued we should look instead to practice to be best and look to be more social leaders. Risk Aversion: Avoidance of failure is a core tenet of management practice. Managers stick with practices that have worked safely for them, often in face of evidence that newer practice is better. Safety is valued. There are real costs to this risk aversion. Hierarchical & Internal: Managers who are more hierarchically senior set the bounds of acceptable management practice and control the HR processes that reinforce acceptable practice. Without an external & learning mindset, these leaders can inadvertently reflect management views and mindsets of a previous generation that were handed down to them during their early career. Responsive Organisations will have a culture and a set of management practices that reflect the needs of our society now. These organisations will experiment, test and measure the effectiveness of their practices in the marketplace and in their organisation. They will not rely on canon, hierarchy or accepted opinion. The benefits of organisations using management practices that better reflect the changing culture of our communities are clear. These organisations will be more human and better able to realise the potential of all people. Bringing this change about is the work of leaders and change agents. Middle managers like to complain about being squeezed by pressures from above and below. Their organisations love to blame them for all the ills in the place. They can place themselves in the heart of the network of their organisations. They have authority to make things happen. Without use, these opportunities whither. Middle managers need to take advantage of them when they can. Frontline employees have very full lives juggling customer expectations. In my experience, they have limited opportunities to engage in networking across the organisation. Enterprise social networks do assist to connect frontline people with the rest of the organisation but the pressures of direct customer engagement often means time is limited and is often focused on better meeting customer needs. Senior management are often removed from the day-to-day interactions in the organisation because of the scale of their jobs and the greater exposure to external stakeholders. Nobody wants a hierarchy where messages need to go to the top to spread because it is a terribly inefficient way to share information. If middle management is to have any meaningful role, middle managers needs to play a role networking the organisation across the middle. Middle manager jobs should give them enough perspective and exposure to their peers to seek and share information widely across the silos and beyond. As nodes in the network of the organisation, managers can dramatically increase their influence sharing information, connecting people, reducing duplication and guiding action. Build a reputation as a generous middle manager who is happy to collaborate, share information and advise and you will find people beating a path to your door. Your authority increases when you want to act. When everyone around you assumes authority depends on hierarchical position, having any hierarchical power is an advantage to action. You don’t need to be at the top, you just need the respect of others. Yet many middle managers wait assuming further endorsement is required. What middle managemers needs to do is leverage their network position and their hierarchical opportunity. Organisations often give way to people who have hierarchical power who are prepared to act, especially where the activity is beneficial and well aligned to strategy and purpose. When I was a mid-level manager in NAB, a group of graduates came to me wanting to know whose authority they needed to set up a TEDX style speaking program in NAB. I told them they needed no authority. It was a great idea, there was a demand and there was no obvious sponsor in the organisational hierarchy. Finding one would be more work than organising the first event. I suggested that they could do it themselves and start straight away. For safety’s sake, I told them that if they were challenged on their authority they should say I approved it. When they did get a challenge, that answer was more than enough because the people who worry about permission rarely have the courage to check its source. A TEDX style event sat well with the culture that NAB was building and the strategy of being more open and aligned to customers and the community. The first TEDX event had over 200 internal attendees and the events which were run by volunteer graduates for 2 more years were huge successes. If you are a middle manager and want that role to continue in your organisation, don’t fall for the blame game. Network yourself to increase your authority and use whatever authority you have to add value in line with the organisation’s purpose and strategy. Undoubtedly many of the leading case studies of future of work organizations are organizations created or rebirthed from near death by charismatic founders. Some use this as evidence that the elements of a responsive organization must be present from the beginning. In a previous post, I pointed out that we cannot rely on transparency alone to make change occur for us. The power structures in a traditional organisation will prevent most radical change. I am unambiguously in the optimist camp. I am not alone and the company in the optimist camp inspires me. I have seen organizations change enough to not recognise their former selves. Change to more responsive ways of working is possible. The question is how. Leaders must create a strong rationale for the transformation. In cases of crisis, startup or near death of organizations, this rationale can often be imposed by a charismatic individual. The external circumstances enable a threat based narrative to bind people together in a defensive rationale for change. The Purpose of the organization: a purpose is the ultimate rationale for why people come together in an endeavour. It defines the common impact the group of people wish to have on the world. As a higher agenda, it is the perfect rationale for change for even the most successful organisations. Purpose is a mastery quest. Very few organizations have the capability to completely fulfil their purpose. They can however strive to better realise it. This post is deliberately not titled like a listicle e.g. ’The 3 or 6 things to transform an organisation’. Even a basic familiarity with change highlights that formulas will work only up to a point. Leadership needs to be adaptive to enable any system to change in a sustainable way. Conflict: The biggest reason that organizational transformations fail is an unwillingness of the leadership of the organisation to allow uncertainty and conflict. Conflict will happen. The uncertainty associated with conflict is inevitable. Efforts to suppress this will either undermine transparency, the rationale for change, engagement or learning. Failure to embrace conflict takes many names: politeness, bureaucracy, politics, corporate speak, history, culture, etc. Failure to embrace conflict is an unwillingness to learn and improve. There will always be resistance when change comes and it must be addressed. Leaders need to create and sustain the right kinds of constructive conflict – driven by purpose, based in facts from an external orientation & experimentation, mediated through an engaged community. I have seen the potential of purpose, external orientation, engagement, trust experimentation and conflict to drive change. Supported by leadership these are the elements of each organization’s transformation. These elements are critical to a Responsive Organization. Throughout this post I have referred to leaders and leadership. This need not be hierarchical leadership. Clearly it helps if leadership and power are aligned in an organization in reinforcing the need for change. However, the changes described above are not capable of being implemented by top-down edicts. These changes must come as individuals and groups discover their power and are influenced as a result, This kind of leadership relies on influence and can begin bottom up or even from the middle management so often scorned in organizations. Man in Black: I can’t afford to make exceptions. Once word leaks out that a pirate has gone soft, people begin to disobey you, and then it’s nothing but work, work, work all the time. Many middle managers have the Dread Pirate Roberts Problem. Changing our organisations will require them to break from moulds of leadership that they have inherited with their roles. Middle managers need to invent the new path forward to more responsive organisations or disappear in the disruption of digital networks. Man in Black: The name was the important thing for inspiring the necessary fear. No one would surrender to the Dread Pirate Wesley. In the film ‘The Princess Bride” we discover that the Dread Pirate Roberts that has been terrorising the seas for 20 years is not a person, it is a role. The title Dread Pirate Roberts has been handed down from one player of that role to the next. Each player carries on the traditions and techniques of the role to maintain their effectiveness. When they tire of the role, they retire passing it on to the next person to play Dread Pirate Roberts with terror, ruthless efficiency and no exceptions. Middle managers can experience the same challenge as the successors of the Dread Pirate Roberts. The role that they take on as managers in a hierarchy comes with cultural expectations that have been built up over years by their predecessors. Culture is an expectation as to patterns of interactions between people. The culture creates expectations of how managers will act, use their power and demonstrate leadership. In many cases those expectations can be no less fearsome than those of the Dread Pirate Roberts. Many middle managers have not seen or been trained in any other models of management and leadership than those that have prevailed in the role or organisation. Asking or expecting these managers to break from these deep cultural expectations on their own is a vain hope. Even if they are given the skills to act differently, they will find their teams and stakeholders are disappointed that they no longer behave as the Dread Pirate Roberts should. The system pressure to return to type in this situation can be strong. Performance management & talent systems reward ‘strong leadership’, usually defined culturally by the existing role of manager. The risk of adopting another model is that any volatility of performance will be seen as failure of the new practice. Personal influence in the networks of ‘strong leaders’ can erode. Struggling to come to grips with new practices managers find management and leadership becomes ‘work, work, work all the time’. It hard not to see why many choose to just continue the traditions, enjoy the rewards and hang out for their chance to retire and pass on the role. Why does Middle Management Need to Change its Approach? Digital disruption and networked ways of working are threatening organisations and putting pressure on the traditional function of middle management roles. The role of middle managers as creators and filters of knowledge disappears as knowledge becomes a flow in networks and technology automates the functions. Middle managers are increasingly facing a need to realise people’s potential in collaboration and create more responsive organisations. More and more organisations are focused on the fact that the poor engagement of people in traditional command and control models is a massive waste of human potential. Every disengaged employee is someone not helping to push the organising forward. More knowledge work demands better use of people’s purpose, passion, creativity and intelligence. Organisations increasingly want leadership in every role, a direct threat to command and control models. Managers need to leverage new mindsets, new questions and gather new knowledge & expertise from networks. However, when these changes require new management and leadership models, the Dread Pirate Roberts problem arises. A middle manager who is expected to manage by control and power will find a shift to the role of an engaging leader, let alone a network navigator, challenging and confronting. They are going to need to give up their traditional models of influence, perceptions of how they create value and ‘work, work, work’ to influence teams and stakeholders that a new approach works. Middle managers need to accept the work & the risks. Leadership is work. In the new era of network disruption, leadership can’t be safe. Managers need to accept that they are the change management. Influence is critical and middle level managers need to use their networks and authority to lead that change collectively. Senior organisational leaders can authorise and support these changes. Senior leaders can help reduce the work and risk of change. However, they cannot make change easier for middle managers. Senior leaders can’t order a change in culture. It will take a new shared story of leadership in the organisation, new capabilities & practices, new systems, and consistent role modelling for a new model of leadership to embed. Social collaboration inside organisations can help managers to accelerate this cultural change by acting as infrastructure of culture magnifying the change in culture and role modelling effective behaviours. Middle managers need to embrace the opportunities to be leaders, culture change agents and to explore the network navigator role, particularly in networks in and around their organisation. These roles may well be the only functions of a middle manager in a future organisation. By experimenting and working collaboratively with their teams and leaders in this way they will discover the right path forward for their organisation & build critical capabilities for the years ahead. Perhaps then all the managers playing the role of Dread Pirate Roberts in organisations can happily retire and hang up their boots. A lot of magic is ascribed to CXO titles. Often there is more real influence in other parts of the network, like middle management. No matter what you think of the CXO roles, one CXO role is critical: The Chief Me Officer. A successful Chief Me Officer recognises the ‘buck stops with the CMeO’ on all matters relating to you, your life and your career. Like a good organisation leader they don’t just focus on one part of their business, you need a whole of life and community view of the impacts of you. With this kind of accountability, this is not a role you can outsource. Family, friends, mentors, organisations, colleagues and people leaders can all help, but they won’t deliver on the plans you need to be successful. Once you build your plan to become a successful Chief Me Officer, you will be well placed to lead others, engaging in collaboration in the new networked ways of working. The future of networked working needs capable leaders in every role. How can you start your leadership journey better than by leading yourself? After publishing my recent post on the four drivers of value creation in collaboration, I chatted with Anna Chu about how these concept is applied. The conversation highlighted to me that there was value in further explaining how to use these drivers to connect senior leaders and employees to the value of collaboration. This post will explore that topic further. As I noted in the initial post the four drivers are a simple tool to find value creation opportunities. Their power is that they act as a link between organisational strategic value whether in economic or non-economic value and the features and benefits of technology solutions and their use cases. The CEO approaches you to improve Innovation in line with the new corporate strategy. The strategy is a little unclear on how innovation works in your organisation so this responsibility is a little daunting. Growth: What outcomes do you hope will grow through Innovation? Effectiveness: How do you see Innovation enable us to do things better? Velocity: What do you want us to do faster through innovation? Protection: How do you see innovation help us to avoid risks? The discussion is long and involves a lot more back and forth but together you clarify that the CEO is interested in how the organisation can more quickly bring products to market based on insights from customers. She is worried about being disrupted by a new competitor. Protection: Alert the whole organisation to the disruptive threat. Engage all employees in the search for customer insights and competitive intelligence. They can come from anywhere. You notice an employee using a collaboration platform in an unusal way and you go engage them in conversation. She is posting daily tips and tricks on password security. The employee explains that she has decided to work out loud on her challenge of improving employee passwords. She knows that passwords impact everyone and her role in IT security doesn’t give her contact with everyone. There aren’t many resources for this initiative. Effectiveness: How can we better secure organisational data and systems to ensure legal compliance and also to maintain a secure environment? Protection: How do we avoid the risks of intrusion or breach of legal compliance? Protection: You are able to engage a much wider group of employees in working together to improve information security more generally. In particular, you let employees know the many risks and legal requirements through discussion and action together. Organisational goals and strategies are unique and highly contextual. So are the goals and strategies of users. The power of the four drivers is that they sit at a middle level of abstraction which helps connect high level strategic concepts and outcomes from the strategy process with specific individual user actions. Using the drivers to guide conversation and to guide questions helps anyone leading adoption to build a much stronger connection between activity and value in both directions. Recently in Change Agents Worldwide we were discussing the challenges of change leadership. What struck me in that conversation was that there is a real challenge of courage for leaders. Change leadership is difficult, not always a positive experience and fraught with failure. Leading change takes people to have the courage to push for change. The challenge of leadership courage in change is not the big risky acts that demand bravery. Big risky acts are those people are expected to pursue in leadership roles. There are rewards for taking the big risks even when you fail. Earlier this year I read my Change Agents Worldwide colleague Lois Kelly’s book, Naked Hearted. The book is about removing the filters and getting to the real issues. Besides being beautifully written, Lois shares a series of personal essays in which she examines many of the ways we can duck the chance to be open and show courage in being ourselves. Lois has taken this theme further and is now running a series of Courage Camps to enable others to examine how to be bolder. The book was a reminder to me that the hardest form of courage is the little everyday acts of courage. These opportunities for leaders to take these small risks come so hard and so fast that it can be easier to take the easy option and avoid them. There is rarely praise and accolades for these everyday actions. At times, there can be enormous social pressure to “accept the status quo”, “fit in and get along”, not to raise “the elephant in the room” or to “go with the flow”. We have lots of phrases to describe surrendering our little acts of courage. We can at times feel that even a single missed moment of action on these little acts creates insurmountable barriers to future action. These little acts offer little reward for action to overcome doubts. With doubts and barriers leading to inaction, over time expectations can arise that certain issues won’t be addressed. The expectations are how toxic cultures are built over time. Each of these acts of courage takes no more than a moment. We barely notice whether they are there or are missing. These are the moments that can often shock us into inaction and we think of things later that we should have said. Often we have to reflect deeply to understand what happened in the rush of our days and how we could act differently. While these acts are small, they are missed if not addressed in the moment. High-performing teams and vibrant cultures create an environment of psychological safety such that these little acts of courage become the expectation. Cumulatively, a cascade of these small acts of courage creates an enormous difference as they role model better culture, enable hard change and enable others to act. I have found myself testing my own little acts of courage a great deal over the last year. I have a strategy of not engaging in political debates because, in our highly partisan climate, open debate rarely creates change or creates productive learning environments. The upswell of discussion in the last year around the world on topics like privilege, sexual harassment, sexism, racism, immigration, gender, sexuality, and nationalism, and more has tested my resolve to sit out. I have made some efforts to discuss the general non-political implications of these issues for communities and society like our need to foster civil society. However, my caution and doubts have been sorely tested. The toxic political environment and lack of civil society around these critical human issues have also seeped beyond political contexts and social media. People have felt emboldened to express intolerance, to foster division or to dismiss the contributions of the marginalised. In the last year, I have had more conversations in both business and personal contexts where people have expressed ugly views in the interests of ‘not being politically correct’. I wish I could say that I had lived up to my own expectations of calling out all these behaviours and displaying the necessary little acts of courage. I was brought up to value politeness and good relations. Staying silent in the face of difficult conversations is too easy. However, it is ducking the hard work that we need to do to create the kind of relationships, organisations and societies. I have kept silent at times too because as a well-educated middle-class grey-haired white male who has held senior management positions I am a representative of the group that has much to learn by listening to other voices. I know I have been the beneficiary of extraordinary privilege in my career. When opportunities keep opening up for you, you know that is more than talent, hard work or luck. Too many hardworking people of talent don’t get the luck they deserve. Privilege also acts an insurance policy. That privilege means that mistakes and shortcomings that might have had ended or held back others have not had that effect on me. I can be an ally to others and I can be braver in helping others to take action on these moments, both little and big. I have kept silent at times too because I have made my own mistakes and not been called on them. Part of privilege is this protection. I’d love to be able to say the only issues were those where I silently acquiesced in decisions or actions of others, but my fingerprints are on too many moments to list. My privileged situation actually protected me from my own failings when others didn’t have the courage to tell me where I let them down. I had one team in my career where I thought I did a great job of management. The team seemed to have a great culture & great performance. In support of those goals, I engaged directly with the team consistently, including regular skip level meetings and working on development plans for the whole team. Only years later did I discover through a third party that one of my team felt bullied by their manager, one of my direct reports. My high expectations, support for the team and praise of their progress was taken as my unwillingness to hear bad news and my alignment to my direct reports. Despite regular interactions, a flat structure and regular open communication, nobody felt it was OK to point out an issue. One little act of courage could have changed that situation by opening a different conversation. I sailed on oblivious convinced in my leadership while others suffered in silence. It makes me wonder how many other stories that I may never know. I can be an ally to others and search harder for the stories that need to be told. The value of being an ally was emphasized yesterday. Oprah Winfrey spoke at the Golden Globes accepting her Cecil B. DeMille Lifetime Achievement award. The response to the speech was dramatic with an upswell of enthusiasm for her leadership and calls for her to run for President. Realising Oprah’s vision of a new dawn won’t take a new heroic leader bring about big change. We don’t need to follow. We need to act on the little everyday acts of change.